John D. Dingell Jr., who had the distinction of being the longest-serving member in the history of Congress, passed away on Feb. 7 at the age of 92. Known in many circles as the “car industry’s congressman” for his unwavering support for U.S. automotive manufacturers, Dingell actually began his career in the House of Representatives at age 12, serving as a Congressional page from 1938 to 1943. 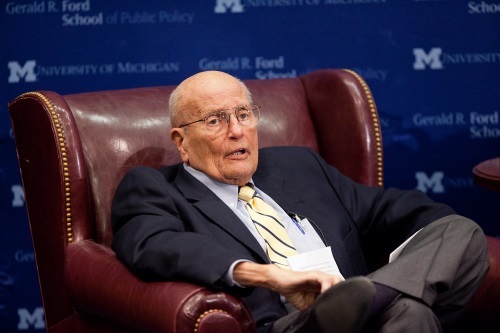 After a stint in the U.S. Army and graduating from Georgetown University with a law degree, Dingell won a special election in 1955 to represent the 15th Congressional district in Michigan following the death of his father, Rep. John D. Dingell Sr. Upon his retirement at the end of the 113th Congress in 2014 after spending over half a century on Capitol Hill, Dingell’s second wife Deborah “Debbie” Dingell – a former General Motors executive whom he married in 1981 and is in her mid-60s – ran and won election to 12th Congressional district in Michigan and still serves today in the House. Dingell was directly and deeply involved in a wide array of legislative issues, including transportation, during his 58 years on Capitol Hill. Not only does he retain the, Dingell was the last remaining member of Congress who voted on the Federal Aid Highway Act of 1956 that created the Interstate Highway System. Dingell talked about his support for that measure in 2006 at a news conference in Detroit that helped launch that year’s nationwide activities commemorating the 50th anniversary of that highways network.